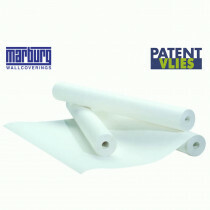 Often the terms lining paper and non-woven wallpaper are used interchangeably. This may lead to some confusion. Therefore, here is the main difference in advance: There are finished non-woven wallpapers with a large selection of patterns and designs. These wall coverings use a special cellulose as carrier material. And there is the lining paper or renovating fleece that you can use as a base for non-woven wallpaper, paints and many other wall designs to create beautiful, smooth and uniform results. Because lining paper is hung strip by strip just like wallpapers, it is often also referred to as wallpaper. For lining paper that is used as basis, the price is often relatively low. It is usually white and is offered by many manufacturers such as Rasch or Erfurt also under the names "Makulaturvlies", "Glattvlies" or "Vliesfaser". As a base wallpaper, it bridges small holes and cracks in the plaster and looks like a smooth, clean wall after drying. You can leave it like this - or you can decorate it further as the mood takes you. High-quality non-woven wallpapers with chic patterns need a smooth base to ensure that they have the right effect. The required renovating fleece or lining paper you best buy directly together with the wallpaper of your choice, then you need to calculate the quantity only once. You need just as much lining paper as you need of the top wallpaper, since you always have to prepare the entire surface. Often there are also special offers, where you can get for example a free role of renovating fleece if you have a certain order quantity. Larger cracks, holes or bumps you should repair with filler and spatula before wallpapering. Porous, highly absorbent, or sandy surfaces can be stabilized with deep solvent primer. Non-woven wallpaper and renovating fleece need not be pasted. Instead, paste the walls and then set the dry strips on it. When hanging base wallpapers, you only need to pay attention that the joints are closed, with patterned or structured non-woven wallpaper you also have to watch the rapport (the correct combination of the pattern). You should always paste just a small part of the wall at once - about the area of three to five strips of wallpaper, depending on how quickly you can work. To avoid that the paste on the bare wall is already dry and the wallpaper does not adhere properly or later peels off again. Make sure that you are using the correct paste and the right tools for pasting, attaching, and cutting. Allow sufficient space and ventilation on your site and protect your furniture, baseboards, floors and co. by covering and masking.